In the 1960’s a frenzy swept across the world, particularly the UK, as fans became obsessed with all things related to the rock band, the Beatles. They called it Beatlemania. Today, in 2018, a similar frenzy is sweeping across the UK. Whilst people are still fanatics, it is for a completely different (and most would say far less entertaining) reason. Forget the Beatles; 2018 has seen Brexitmania (or just Brexit, if you want to be less fun) take hold of the UK as Britain looks to leave the European Union in early 2019. If this comes as fresh news to you, I would like to welcome you out from that rock you have been living under. For everyone else, unless you have dedicated a few hours to reading some (really dry and boring) articles about Brexit, I have no doubt you were like me at the beginning of writing this guide - aware that Brexit is a big thing that I should probably know about, but also kinda confused and hoping it wouldn’t impact my spending money on my next European summer trip too much. Here is where I tell you that I have some good news, and some kinda good but also kinda bad news. Good news: I’ve done the research for you. So sit back, have a quick gander of this article and you will be across all this Brexitmania in no time. Kinda good but also kinda bad news: Unless you have a crystal ball or that car from Back to the Future, we can’t say for sure what will happen in the foreign currency markets after Brexit. 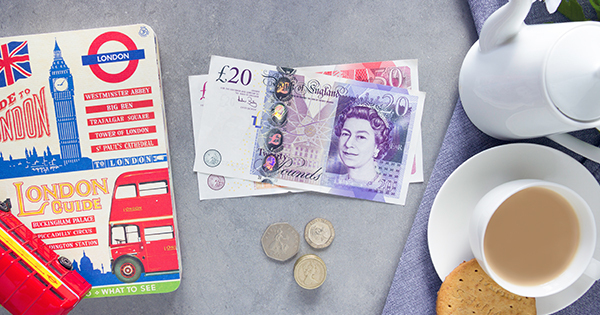 Rest assured though, we can give you some tips on what to look out for and monitor to ensure your travel money doesn’t take a hit from Brexit. Scroll down for the latest Brexit news. Alright, hit me with the cold, hard, Brexit facts. P.S. If you are already all over Brexit like a rash and just want to know how it will affect you as an Aussie traveller, look no further. What does Brexit even mean? If someone talks about Brexit, they are talking about the UK leaving the EU. Brexit is literally just Britain’s Exit. I still think ‘C EU l8er’ would have been a cool alternative, but it doesn’t seem to be catching on. Who’s in the United Kingdom again? 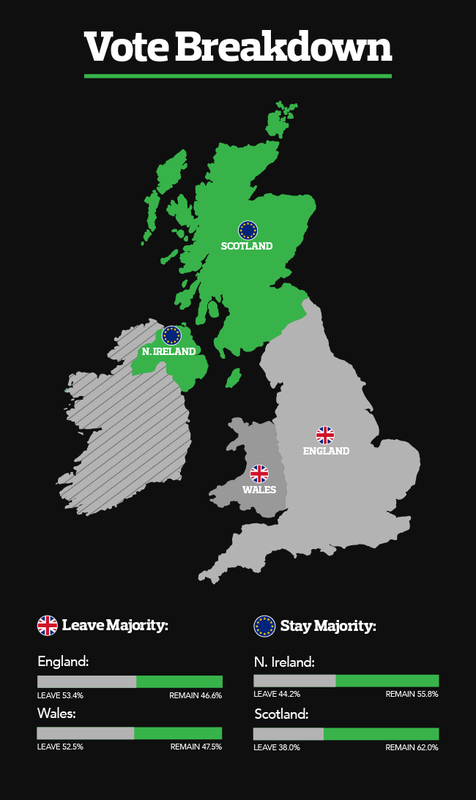 England, Scotland, Wales and Northern Ireland form the United Kingdom. What about the rest of Ireland, you ask? The Republic of Ireland is part of the EU. After the conclusion of World War II, 28 countries came together in an economic and political partnership in an attempt to encourage economic cooperation and preserve the peace. The EU has since evolved to become a ‘single market’, allowing citizens of member states to move and trade freely as if it is one country. Pretty nifty, hey? Of the 28 countries, 19 use the Euro. Now that we are across that, let’s get back to Brexit. On the 23rd of June 2016, the UK held a referendum, asking citizens if the UK should stay or leave the EU. The UK had to invoke Article 50 of the Lisbon Treaty, which is essentially five paragraphs written on the off chance that a country wanted to leave the EU (never thinking that someone would actually want to leave). Article 50 gives both sides two years to agree on the terms of the split (money owed, trade and border control, the movement of people throughout the countries etc). This two year period ends on Friday 29th March, 2019, however it can be extended if all 28 EU members agree. Why did the UK want to leave in the first place? Budget - In 2016, the UK’s net contribution to the EU was 8.5bn pounds. Logic therefore denotes that leaving the EU would allow for a nifty little saving on the UK’s behalf each year. However, we can’t yet determine if the financial benefits of being part of the EU, like free trade and inward investment, outweigh the upfront costs. Plus, Britain's ‘divorce bill’ is looking to be anything upwards of 20 billion pounds. Ouchies. That’s definitely gonna need more than a cheeky side hustle to pay off. Sovereignty - Being part of the EU means British Parliament relinquished some control over domestic affairs. However, it also gives the UK a voice as part of a very influential global negotiating power. Trade - The leavers maintain that leaving the EU single market will allow the UK to make its own trade agreements on the global stage. In addition, they argue that most small and medium firms don’t actually trade with the EU, despite having to comply with the EU’s imposed regulatory burdon. The remainers highlight the benefits of being part of the single market, like not having to pay tariffs on imports or exports to member state countries. Plus, leaving would reduce trade and UK’s negotiating power on the global stage. Sheesh. Investment - Leavers encouraged the notion that detaching from the EU’s rules and regulations is the perfect chance for the UK to reinvent itself as a ‘supercharged economy’. Remainers stand by the fact that leaving the EU would severely diminish the UK’s status as one of the world’s biggest financial hubs. Removing itself from the EU will, in turn, stop it from being an English-speaking gateway to European businesses and banks. Immigration - All EU member countries allow for the free movement of citizens throughout. So, UK citizens could live in Europe (hello, bulk croissants) and vice versa, European citizens could move to the UK if London was, in fact, calling. As a result, immigration to the UK spiked, leading to housing and service provision issues. Whilst leaving would allow the UK to set their own immigration rules, it may impact the country negatively in other ways as the net effect of immigration was argued to be positive overall. Jobs - “The immigrants are taking our jobs!” is essentially the argument from leavers. Remainers argued that over 3 million jobs would be lost as a result of Brexit. If the UK is no longer a gateway to Europe, a lot of companies and jobs will move elsewhere - like Dublin. Plus, reducing the labour marketing could not only slow down the economy, but would widen the gap further on skill shortages that are otherwise supported by immigration. Security - “We’re letting the terrorists in!” is the argument from leavers, as open borders mean there is an inability to check and control individuals as they enter. Remainers argue the opposite, saying the EU is an important pillar in the UK’s national security as it allows for the exchange of criminal and passenger records along with joint counter-terrorism efforts. It's past the 29th of March, why is the UK still in the EU? Despite getting her withdrawal agreement approved by the EU, British Prime Minister Theresa May failed to get the support of parliament. The withdrawal agreement has been put to a vote three separate times and has been defeated in each. To avoid crashing out of the EU without a deal, Prime Minister May was able to secure an extension until the 12th of April. However, as no agreement has been approved by parliament, they can't find a majority on what said agreement should look like and they have voted against leaving with no deal, it is highly likely they will need to get a further extension. Check out Brexit latest below to stay up to date with the latest developments. There you go - Brexit in a nutshell. It’s a big, convoluted beast that is nowhere near as groovy as Beatlemania. We recommend signing up for Currency Alerts to see if Brexit causes the AUD to gain against the GBP. It’s also worth keeping any eye on the news for future updates, particularly around the following key dates. Despite being 'Brexit day', the UK still has no idea what they are doing when it comes to Brexit. Luckily for them, they have been granted a few extra days to try and get themselves sorted. If British MPs can agree on a deal today, they’ll wipe the sweat off their brows proclaiming ‘phEU’, as they will have an extension until the 22nd of May. However, if they can’t agree on a Brexit withdrawal agreement (which is pretty likely based on past behaviour), they will only have until the 12th of April before the UK leaves the EU. One currency that has not been particularly steady this week against the AUD was the Great British pound. You could compare its movements to one of those spew inducing rides that throw you up and down rapidly, without any real consideration for the riders enjoyment. Whilst we can’t reduce that sick feeling you get after said ride, we can give you some peace of mind with currency movements. Simply add Rate Guard to your purchase in store. If the exchange rate shoots up within 14 days of purchase we will refund you the difference*. The best bit? It’s free! Keep in mind that the votes happened in UK time which is overnight for Aussies. The fall in value we saw on the 13th (Wednesday) would have left you taking £18.40 less pounds when exchanging $2000AUD, compared to the day before. After three days of votes, we are only slightly closer to knowing what is happening with Brexit. Thankfully a no-deal has been ruled out. This is not only good for the UK but also Australia, as we would have felt the negative flow-on effects. Whilst the UK has agreed to extend Brexit, they still need to get all other 27 nations in the European Union to unanimously approve it. Long story short: there were three votes where lawmakers decided to rule out a no deal and extend a process that has been going for 2 weeks. So, much of the same really. British Prime Minister Theresa May has concluded talks in Strasbourg with the European Union. Reports are surfacing from Cabinet Office Minister David Lidington in a statement to Parliament that May has “secured legally binding changes” to “strengthen and improve” the UK’s current withdrawal agreement. These changes will not necessarily affect the current terms of the withdrawal agreement, rather just offering some legal assurances to back it up. In essence, the changes will provide some legal guarantees and a bit more clarification. This information provided a boost to the value of the GBP. This was not ideal for the Aussie traveller, who could get £1,041.80 exchange $2000AUD yesterday, compared to £1,033.80 today; a difference of £8. British MPs are now set to vote on the said deal Tuesday UK time. If the agreement is not passed, there is likely to be a string of other votes throughout this week to rule out a no-deal Brexit and potentially extending the March 29 deadline altogether. Only 20 sleeps until Brexit! As the UK and global citizens alike countdown the days until Brexit, British MPs still really don’t know what is happening with this whole ‘leaving the EU’ thing. Despite sounding like a broken record, there really is nothing different to report from this time last week. Prime Minister May will face MPs next Tuesday (again) in the hope that they will vote in favour of her Brexit agreement. Should this deal get voted down, MPs will most likely vote on Wednesday to remove the possibility of leaving the EU with no deal. If this vote is successful MPs will then have another vote on Thursday on whether they should ask the EU for an extension. Three votes in one week? Sheesh, the poor MPs might actually have to do their job and make a decision! Crazy, I know. Here’s hoping they can pull their fingers out and place their votes with Britain’s best intentions in mind. Either way, this time next week we should have a much better idea of the UK’s trajectory in regards to leaving the EU. The value of the AUD against the pound has seen a steady decline since a peak on the 3rd of December 2018, where one Aussie dollar would buy 0.5554GBP. Today’s rate of 0.5151 is significantly lower, and would see you taking £80.60 pound less if you exchanged $2000AUD now compared to December 3rd. The pound’s renewed strength can most likely be attributed to the fact that leaving the EU with no deal is becoming less of a possibility. The Aussie dollar has also been facing its own battles irrespective of Brexit, which has put further downward pressure on its value. The GBP has shown a little bit of strength over the last couple of weeks as the chance of a hard Brexit has reduced significantly. Good news for the UK, however, not so great for Aussie travellers exchanging their AUD. It sounds like the Withdrawal Agreement (WA) has a great chance of being agreed upon or at least gaining a majority after the next vote on March 12th. This comes after the lead Brexiter group appeared to have softened their opposition to Prime Minister Theresa May’s current WA. Ministers are also seeking to secure some legally-binding changes to May’s current deal that will make it more appealing to MPs come vote time. Should the WA be voted down next week, May will bring forward a vote to delay Brexit in order to avoid crashing out of the EU with no deal. Either way, there is unlikely to be any clear direction for GBP movements until a decision has been made to either accept the current agreement, leave the EU with no WA, or delay a decision and Brexit all together. Overnight, Labour leader Jeremy Corbyn announced his party would back a new Brexit referendum. This would only occur if the Conservative government failed to accept Labour’s current plan that includes a permanent customs union with the European Union, continued workers’ rights that mirror those of the EU, and close ties with the EU single market (in other words, better trade deals). If British Prime Minister Theresa May does not accept these alternative Brexit deal amendments, Corbyn will begin his push for a second referendum. This comes as PM May faces growing pressure to close a deal or seek an amendment of Article 50 to avoid the United Kingdom jumping out of the EU aeroplane with no parachute (or deal) on March 29 2019, the current Brexit deadline. Despite MPs calling for another meaningful vote as soon as possible, Theresa May has announced the next vote will be on the 12th of March. This gives the UK 17 days to sort themselves out before they leave the EU. The countdown is on! Sure, 17 days sounds like a lot. However the UK has had two years, or 730 days, to get their act together. Time is running out, and all politicians have done for the last month or two is talk and talk without actually deciding on anything. British Prime Minister Theresa May is facing another string of walkouts from the Conservative party as they protest the country’s current trajectory toward a no-deal Brexit. Next Wednesday will see British MPs face (another) vote in which many are seeking a delay to Article 50, as well as a rule out of a ‘no deal’. Prime Minister May has already survived two rounds of resignations and is currently working to secure changes to the current withdrawal deal with the EU in hopes of Parliament approving it. Long story short, there has been a lot of political talk and power plays, however, Britain is still no closer to any sort of Brexit agreement. This will continue to affect the value of the pound as markets digest the constant stream of political dribble that is coming out of the UK. If you are travelling to the UK soon, it’s definitely worth keeping an eye on Brexit happenings (as painful as that might be) to take advantage of any dips in the value of the pound against the AUD. The biggest Brexit news since we last spoke, was the departure of seven members of the UK’s Labour party, who have left to assemble their own political grouping called the “Independent Group”. These seven members are said to be extremely dissatisfied with Labour’s leadership with regard to Brexit, particularly the failure to call for a second referendum. With this in mind, there is an increasing likelihood of a delay to Brexit (extension of Article 50) and a second referendum. In other news from the UK, Honda also announced plans to close its UK factory with Japan-based manufacturing to take over for the European market. While Honda made it clear that this decision was based on global trends and not Brexit, it’s probably fair to say Brexit was at least part of the reason they drove out of the UK market. In ongoing Brexit news, Britain's parliament has voted (303 to 258) against a motion endorsing Prime Minister Theresa May’s “Plan B” approach to resolving the Brexit deadlock. It looks as though Parliament will take control of the process from 27th February, as the latest vote has effectively stripped May of the political mandate to demand the changes to the withdrawal agreement. With just over a month until Brexit d-day, it’s imperative that British Parliament gets a move on with negotiations. British MP’s voted on Tuesday on a number of amendments to the current Brexit withdrawal agreement. There was a resounding push for changes to the Northern Ireland backstop. As a result, Prime Minister Theresa May will spend the next few weeks negotiating with MP’s and the European Union on a new deal. UK Prime Minister, Theresa May, has finally announced a date for British MPs to vote on her Brexit deal after postponing the original vote, scheduled for the 11th of December 2018. The new vote will take place next Tuesday 15 January 2019 (Wednesday 16th Australian time). Should there be a majority vote against the proposed deal, the prospects of leaving with a ‘no-deal’ will become much higher. In preparation for this instance, over 200 MPs have already signed a letter urging May to rule out a no-deal all together. On the flip side, many conservative MPs are actively calling for Britain to leave without a deal. They argue that May’s current deal is not reflective of the Brexit that citizens originally voted for in the referendum. Leaving without a deal means the UK would automatically fall back on the World Trade Organisation rules. We will just have to see what will happen with next week's vote, as the decision will have a major impact on how Brexit continues to unfold. Yesterday’s vote of confidence against PM Theresa May saw her win 200 votes to 117. Whilst this is positive for her, it still means she doesn’t have support from a third of her party when it comes to negotiating and passing the proposed Brexit agreement. Her win may have removed some of the uncertainty surrounding her Party’s (the Conservative Party) leadership in the UK, however it came under the promise that she will not stand for re-election. It appears she has taken this short term win in the hopes that she will be able to get the Brexit agreement across the line, ready for the March 29 Brexit deadline. This win for PM May translated into a win for the pound, pushing it up slightly. Against the AUD, the pound went from 0.5528 to 0.5489. If you were exchanging $2000 AUD to pound today compared to yesterday, this rate change means you’d be getting approximately 7.80 pounds less - or a pint at the pub. Whilst this drop wasn’t the best for Aussie travellers, I wouldn’t stress too much yet. After the December 11 deadline for MPs to vote on the Brexit agreement was delayed earlier this week, we still do not have a date for the vote to take place. This, coupled with the continued speculation about the Brexit deal being passed means the pound still has a long road paved with market volatility ahead. If you do need to purchase GBP in the next few days, we recommend adding Rate Guard on to your transaction in store. Not only is it free, but if the Aussie dollar improves against the pound within 14 days of purchase we will refund you the difference*. Summary: May stays but the UK's still leaving. Today, British MPs were supposed to vote on the current Brexit deal. However, after expectations that the deal would have 187 votes against 419, UK Prime Minister Theresa May has delayed the vote to avoid the almost certain defeat. To put the number into perspective, the deal needs 320 votes to pass. So, where does this leave the UK? Not in a great position if we are being honest. A no deal. This would see the United Kingdom leaving the EU with nothing but their dreams, some debt and a good cup of tea. Definitely no trade deals, border negotiations or things that are quite important for the wellbeing of the UK’s economy and best interests of the citizens. Joining the European Free Tree association. Once again, there is no real majority in favour of this. A people’s vote on a Brexit agreement. A second referendum to see if UK citizens are still in favour of leaving the EU. While some of the population could vote differently in a second referendum, obviously a second referendum undermines the original referendum at a considerable cost to the UK’s economy. According to a written statement to Parliament from March 2016, the estimated cost of conducting the original referendum was a whopping £142.4m. Imagine paying that bill again. Most citizens and politicians alike are against a no deal, but also have no alternative as to what a deal should look like. It has been confirmed that the UK can decide not to leave the EU if they wish, however the EU has made it clear that they will not renegotiate the withdrawal agreement. Crikey. The lack of support for any of the options has resulted in the odds of a no deal rising exponentially. It is also highly likely that the March 29 Brexit deadline will be extended. If you haven’t already guessed, the UK government is in disarray at the moment. Or, as my dad would say, they are running around like a bunch of headless chooks. The prospect of a general election is becoming more likely, especially amidst calls for May to resign. If that’s the case, who would take her place, and would she ever get the chance to work in ye old London town again? This growing mass of uncertainty has reflected on the pound’s performance, pushing it down lower against most major currencies. If you’re travelling to the UK soon, it's definitely worth keeping a close eye on Brexit news to see how they are affecting the GBP. Maybe also take them some tea, everyone sounds really stressed over there. Overnight saw the UK Treasury and Bank of England (BoE) provide risk assessments of potential Brexit scenarios. The Treasury forecast that a ‘no-deal’ scenario would lead to a 9.3% hit to UK Gross Domestic Product (GDP) over 15 years. The BoE forecast the same scenario would lead to a 25% fall in GDP, thus resulting in a need for the Bank to increase interest rates to 5.5% to control inflation. The Treasury didn’t forecast the recently agreed deal with the EU, however, a close variant was modelled. The model showed a 3.9% decrease in GDP over 15 years. Whilst this is definitely better than the consequences of a ‘no deal’, both institutions agree that the UK will be poorer economically under any form of Brexit situation, compared to just staying in the EU. In addition to this, talk of a second referendum is continuing to grow. It will be interesting to see what happens in the coming weeks as Prime Minister Theresa May continues to rally MPs for support of the current agreement. Should May not gain enough support during the vote on 11 December, the UK will need to return to the drawing board and face the reality of a ‘no-deal’ scenario. Therisk assessment scenarios did not have a major impact on the pound against the AUD; even so, the market will remain extremely cautious as we move through the next few weeks. Months of negotiation have resulted in a draft withdrawal agreement covering Britain's divorce bill. The draft withdrawal agreement protects the rights of citizens affected by Brexit (Brits living in the EU and vice versa) and keeps the Irish border open for trade. The UK can negotiate its own trade deals in this time, however they will not come into effect until the transition period ends. EU leaders gave their formal backing to the Brexit deal at a summit on Sunday 25 November. They also made it clear that there is no plan B except for a ‘no-deal’, should British MPs in the House of Commons reject the deal during a vote held on the 11th of December. Getting this deal approved will be challenging, with a number of MPs anxious about the proposal. May must now spend the next few weeks selling the deal to MPs before the vote on December 11.